When sales taxes change it is important that you proactively update your existing orders for the new tax rates. If you fail to do this, tax reporting will be very arduous for a few months after the change. This article covers the guidance Cyrious provided for tax changes that several Canadian provinces under went in 2010. The approach, however, can be generalized to cover all sales tax rate changes. **Note:** If you are using Avalara's AvaTax online tax look-up, the change should be picked up automatically and you do not need to manually configure anything. However, editing and saving orders in WIP and Built is still recommended. Update the existing tax account to the new rate. Edit and save all orders in WIP and Built so they recalculate with the new rate.In all cases Cyriousis aware of so far, if the order is not delivered or installed by the date the new tax takes affect it is subject to the new tax rate. Therefore, all WIP and Built orders are normally taxable at the new rate. Check your existing tax regulations to see if this is how the change affects your WIP and Built orders. Create a new tax class for the old rate. 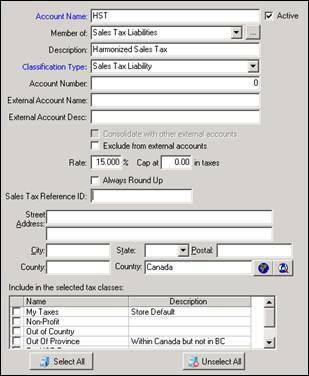 Edit and save all orders in Sale (accounts receivable) and change the tax class to the new tax class with the old rate. Ths ensures that future edits, payments, or incidental changes don't recompute using the newer tax rates. Your tax changes may not exactly mirror the example here, so make sure you both understand the general concepts outlined and discuss this approach with a qualified tax expert. Tax law is local, and Cyrious is not a qualified tax expert in your locality! The detailed steps used in the Canadian tax change, where GST and PST were replaced by HST, follow. These steps may not exactly mirror your case, but the guidance may still prove helpful. Update your default sales tax rate. Close the month after printing your normal reports. 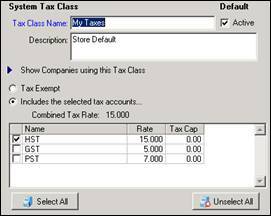 Create a new Tax Account (in your Chart of Accounts) for the new tax HST rate. Open Setup | Accounting Setup. Click on “Chart of Accounts” in the left list. Expand the “Liabilities” account group. Expand the “Sales Tax Liabilities” account group. Based on your setup, this account group may not exist, may be called something else, or may be inside another group. You are looking for whichever group contains the sales tax accounts. If you don't have an HST liability account already, click on the “Sales Tax Liabilities” group and click the “Add” button above it to create a new account. If you already have an HST account, make sure it is Active and the values mentioned below are set up correctly. Enter “HST” as the account name. Enter “Sales Tax Liability” as the Classification Type. If you export your GL to another accounting system, enter the appropriate export information. Otherwise you may leave these blank. Enter the Tax Rate. Leave the “Cap” at 0.
f you are creating this tax account, do not check any items under the “Include in the selected tax classes” section. You will complete this in the next step. Edit your existing default Tax Class and set it to use this new tax account. Uncheck the old PST and GST tax accounts. Click on “Tax Classes” in the left list. Click on the default tax class. It will have a different icon than the others. Click “Edit” to put the tax class in edit mode. In the “Includes the selected tax accounts …” list, uncheck “GST” and “PST”. 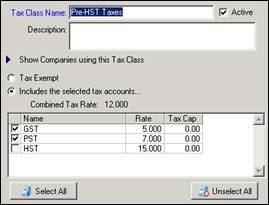 Check “HST” to include HST in the tax class. Adjust your orders in WIP and Built. Open EVERY order in WIP and Built. Click on Edit and then Save. Enter “Tax Change” as the update reason. This will ensure the updated taxes are used when the order is marked a sale. Close the month again by clicking on File | Close Period | Close Month. It is not necessary to print any reports for this second closeout. Create a new Tax Class called Pre-HST Tax and set it to use the older GST and PST tax rates. Click “New” to create a new tax class. Enter “Pre-HST Taxes” as the tax class name. In the “Includes the selected tax accounts …” list, check “GST” and “PST”. Open EVERY order in Sale. Click on Edit. On the totals tab, click on the button displaying the tax amount. Select the Pre-HST Tax class. Click OK, and then click on Save. Enter “Tax Change” as the reason for the update. This will set the taxes for this order to the older tax rate and ensure future edits to the order don't unintentionally adjust the taxes owed.